The writer Hermann Bahr describes Salzburg as "music turned into Stone". The film "The Sound of Music" made Salzburg famous across the globe. Celebrated internationally as the city of Mozart and of the Festival, it is a synonym for music. Salzburg, City of Music is the starting point of this presentation. The Salzburg Museum’s historical musical instruments are the protagonists in a scenario that puts the focus on selected events in the history of music in Salzburg. They tell us about the music, the performance venues, the outstanding personalities, special happenings and more. But they also testify to the power and brilliance of the Salzburg prince archbishops, and the growing self-assurance of the Salzburg burgher class. Thanks to a cooperative venture with the Mozarteum University Salzburg, the original historical musical instruments are not only on display but can also be experienced audio-visually in film footage. The instrument was "once owned" by Johann Michael Haydn. Johann Evangelist Schmid came to Salzburg on Leopold Mozart’s recommendation as the last builder to the court of organs and pianos and made the instrument in 1803, the year the ecclesiastical principality was secularised. The grand piano’s full and mellow tone corresponds to the sound ideal of the Early Romantic era. Marie Mösner studied with Félix Godefroid (1818–1897) at the Paris Conservatory between 1855 and 1857. She finished her studies by taking part in a competition and winning the first prize and this double-pedal harp in Gothic style by Maison Érard. The double repetition for the harp in which the strings can be tensioned by pedal pressure to sound a semitone higher is a patented invention of Sébastien Érard dating back to 1810 and today a standard feature in modern concert harp construction. The main motives for producing this instrument might have been relating to practical performance, in order to facilitate and improve continuo playing. It emphasises the enhancing sound of a bass lute and is easier to tune and learn because the number of strings has been reduced – from twelve, i.e. six string courses, to six single strings. In 1681 Johannes Schorn was designated as "fidicen" (lutenist), which means he might have come to Salzburg as a player. Producing nine masters within five generations, the Ehe family contributed much to the fame of the city of Nuremberg as a centre for the production of wind instruments. The trumpet maker Friedrich Ehe marked his instruments with "F E" above a six-pointed star. The two instruments were played with trumpet mouthpieces. Entered in a list of 1769, in which new musical instruments were ordered for the Salzburg military music, are "2 such small ‘horns’ in D-sharp". In 1886 the museum acquired a "genuine Stainer violin, viola d’amour" from "Mrs Pichler" in Froschheim. The label inside bears the inscription: "Jacobus Stainer in Absam / prope Oenipontum … 1661". The musicologist Karl Geiringer (1899–1989) already underlined the similarity to Schorn’s instruments. It has not yet been established whether Stainer or Schorn made the instrument. The peg box of this viola d’amore ends in a carved, blindfold Cupid’s head. Joannes Maria Anciuti born in Forni di Sopra near Udine worked in Milan and Venice as a maker of woodwind instruments. He often used precious materials such as ivory, silver, rosewood and grenadilla, an African wood. Like all early contrabassoons and despite a total length of 305 cm, his instrument also has only one kink in the boot joint. The bell joint has the form of a dragon’s head; its tongue vibrates when the instrument is played. This resplendent Alpine zither arrived in the museum in 1899 as a gift of Regina Seidl, the wardrobe mistress to "Her Imperial and Royal Highness the Grand Archduchess of Tuscany". Joseph Achleitner had left her the instrument in his will and while still alive dedicated a march to her for the "Elegie Zither", the alto zither. 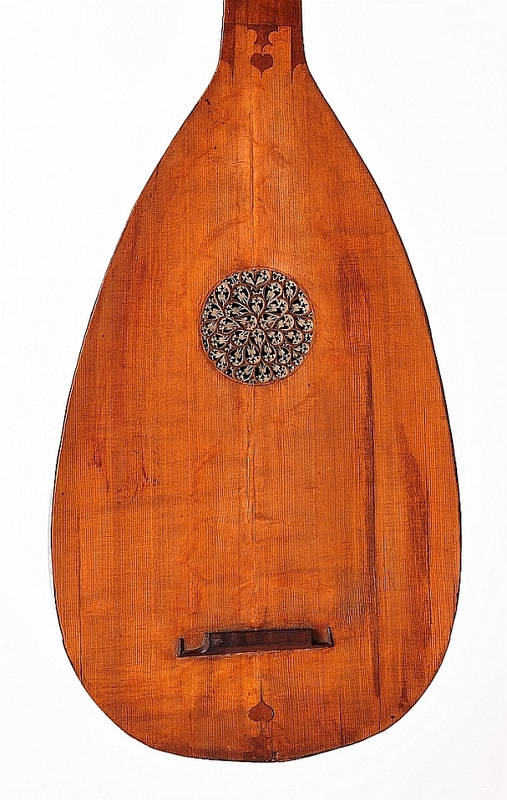 Like all zithers, the elaborately ornamented Alpine zither has two playing areas: five fingerboard or melody strings and in this case 45 instead of up to 40 accompaniment or drone strings. The fingerboard strings are plucked with a plectrum on the thumb of the right hand, while the fingers of the left pluck unaided. The accompaniment strings are plucked with the fingers of the right hand.